This yarn is just absolutely gorgeous. I had been indecisive about what to make for a while - I really wanted to crochet something but I just couldn't find a pattern. Then Mindy took a delivery of this, and the patterns to match, and I knew it was the 'one'. I haven't knitted for ages, not since about 2009, in fact. Complicated patterns scare me, so unless it's labelled an 'easy knit' I'm not really interested. Fortunately, this yarn is self-striping so I don't need to do any complicated stitches, just knit & purl and let the yarn do all the work. Isn't it gorgeous? Well, when I say the yarn does all the work...the pattern I chose has rows of over 300 stitches, which is not exactly easy. But, as it's knitted all in one piece, at least I won't have too much sewing up to do. It's still a work-in-progress, as I need to sew two seams and knit the edging. 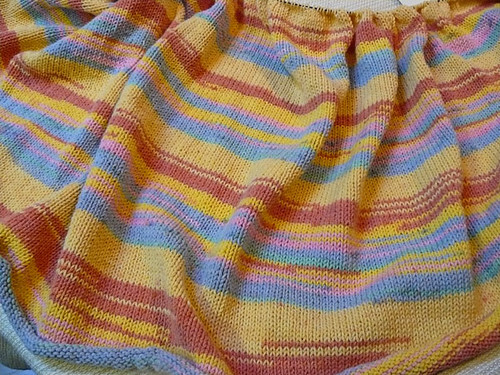 I have a sad history of unfinished knitted pieces, which is why I was a bit wary of sharing this in case in never makes it out of the basket...but it's looking hopeful that it will be wearable soon.